This from John Eldredge’s daily devotional. Sad but in many cases true…. 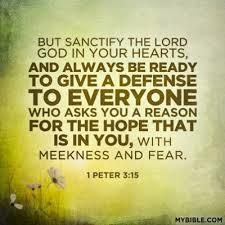 A curious warning is given to us in Peter’s first epistle. There he tells us to be ready to give the reason for the hope that lies within us to everyone who asks (3:15). Now, what’s strange about that passage is this: no one ever asks. When was the last time someone stopped you to inquire about the reason for the hope that lies within you? You’re at the market, say, in the frozen food section. A friend you haven’t seen for some time comes up to you, grasps you by both shoulders and pleads, “Please, you’ve got to tell me. Be honest now. How can you live with such hope? Where does it come from? I must know the reason.” In talking with hundreds of Christians, I’ve met only one or two who have experienced something like this. Yet God tells us to be ready, so what’s wrong? To be blunt, nothing about our lives is worth asking about. There’s nothing intriguing about our hopes, nothing to make anyone curious. Not that we don’t have hopes; we do. We hope we’ll have enough after taxes this year to take a summer vacation. We hope our kids don’t wreck the car. We hope our favorite team goes to the World Series. We hope our health doesn’t give out, and so on. Nothing wrong with any of those hopes; nothing unusual, either. Everyone has hopes like that, so why bother asking us? It’s life as usual. Sanctified resignation has become the new abiding place of contemporary Christians. No wonder nobody asks. Do you want the life of any Christian you know? Posted in encouragement, perspectiveTagged desire, john eldredge, ready? It’s true. I know some great “Christians,” and there’s a lot about them I wouldn’t want in myself. I don’t even like mySELF as a Christian. Still working on it.